Royal Caribbean unveiled the fourth Oasis-class cruise ship Symphony of the Seas in Spring 2018. Just like her sister ships did when they entered service, she also takes the title of the world’s largest cruise ship. The cruise line spent a total of $1.35 billion building this vessel and it was completely worth it. The huge 228,081 gross ton vessel is a floating city and there is something for any type of cruiser. We’re going dig deep and find out all those “WOW” things to do on Symphony of the Seas. Disclaimer: This post contains affiliate links which will earn us a commission if any purchases are made. Volume-wise, Symphony of the Seas is the largest ship in the world weighing a whopping 228,081 gross registered tons. 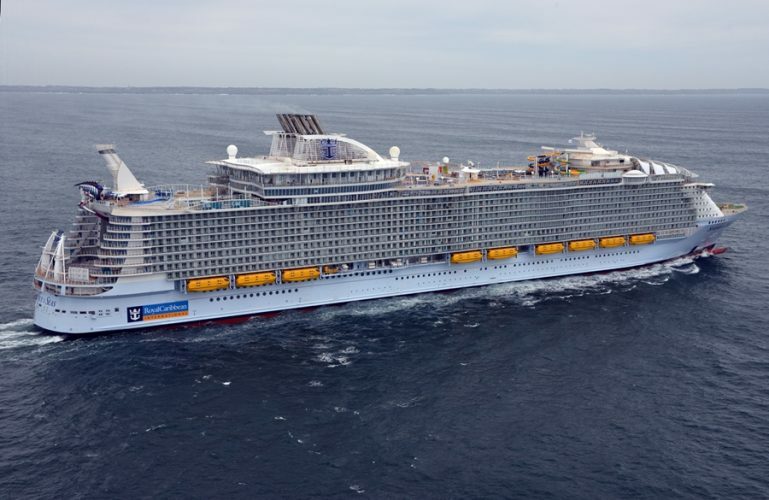 Measuring 1,188 feet long (about the size of 4 soccer pitches) by 215.5ft wide, the ship has 2,759 cabins, 12 more cabins than its sister ship, Harmony of the Seas. Get all things Royal Caribbean by clicking here. 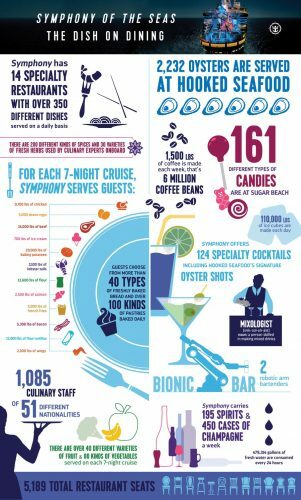 Symphony can carry up to 5,518 guests at double occupancy. She has 2,200 international crew members and carries 6,680 passengers at full capacity. There are a total of 18 decks on the ship, 11 of them featuring balcony staterooms. Water lovers won’t be disappointed on this ship as it features a total of 23 pools and Jacuzzis. Surprisingly, despite the high number of passengers on the ship, one rarely feels crowded thanks to the distinctive neighborhoods on the ship. Just like other Royal Caribbean ships in the class, Symphony has sections called neighborhoods. These neighborhoods allow you to hang out in your preferred areas or venues without feeling crowded. 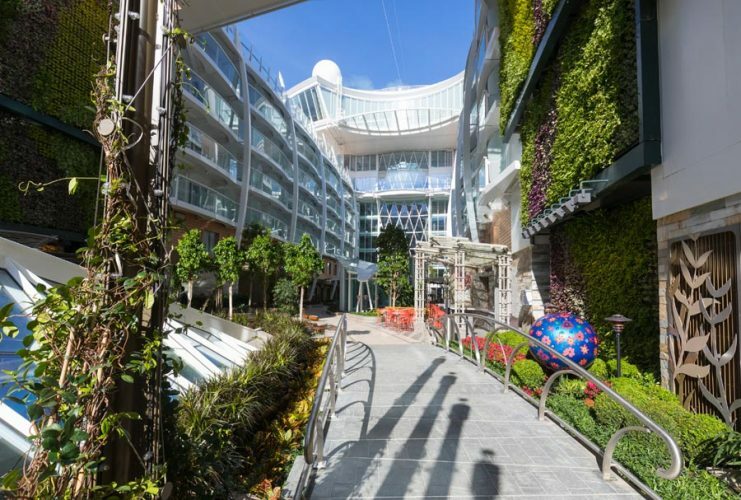 The ship has seven neighborhoods: Boardwalk, Royal Promenade, Central Park, Entertainment Place, Youth Zone, Pools-Sport Zone, and the Vitality Spa/Fitness Area. Each of these neighborhoods offers unique experiences and amenities for you to enjoy. Hang out with like-minded individuals at the new and improved Boardwalk neighborhood that features all the works, such as a game arcade, casinos, a carousel, the aqua theatre and nice joints to grab a meal or snack at. Some of these options include Johnny Rockets, Boardwalk’s Doghouse, the new ice cream place Sugar Beach and the new Playmaker Sports Bar where you can catch your favorite game live on the screens. The Pool and Sports Zone neighborhood is perfect for adrenaline junkies. It features most of the pools, Jacuzzis, the 3-story waterslide dubbed the Perfect Storm, as well as the tallest slide at sea, the Ultimate Abyss. Other features of this neighborhood include Splashaway Bay, the zip line course, FlowRider surf simulator and a sports deck with volleyball, basketball, golf and soccer areas. Try at least one of these amenities and you are guaranteed to have a good time on your cruise. Nature lovers who value peace and tranquility will absolutely love the Central Park neighborhood. This section of the ship features an outdoor park with over 12,000 flowering plant species. The park is complete with benches and winding paths to walk along and enjoy the view. It offers the perfect environment to catch up on your reading, have intimate chats or people watch. The park has retail outlets, entertainment venues and restaurants as well. Grab a bite at Chop’s Grille, Jamie’s Italian, Vintages, Park Café or 150 Central Park. The Entertainment Place neighborhood, featuring the Royal Theater and Studio B, is the place for just about anyone. Enjoy all manner of shows here from comedy, musical, dance, magical, acrobatic or even ice skating shows. The most popular neighborhood on this ship is the Royal Promenade. It’s the heart of the ship and is where most of the dining and interactive activities take place. Common eateries featured here include Sorrento’s Pizzeria, Café Promenade, and the main dining room. Most of the bars on the ship are found in this district too, including the Rising Tide bar which is the first that moves at sea, it ascends from the Promenade deck on deck 5 to Central Park on deck 8. Popular bars like Bolero’s, Copper and Kettle and the On Air Club are also in this neighborhood, and the Royal Promenade is also home to the futuristic Bionic Bar, where robot bartenders attend to you. Your kids will love the Youth Zone, which features play areas for different ages, including toddlers. Your teens will have a chance to mingle and make new friends as well as one of the many meetup venues available for them in prominent in this neighborhood. Last but not least is the Vitality Spa and Fitness neighborhood. This is where you go to lose all those extra calories from last night’s hearty meal. This neighborhood features a fully equipped gym, a 1-kilometer track, the spa and a fitness area. Visit this section of the ship to enjoy some royal pampering at sea. Get all your cruise accessories from Amazon before your Symphony of the Seas adventure. Another impressive feature on Symphony of the Seas is the Bionic Bar, found on the Promenade deck. Enjoy this technological wonder as two robotic arms mix, shake and pour drinks for you. Among Symphony of the Seas‘ firsts is the tallest dry slide at sea. If you are daring enough, take a leap into the Ultimate Abyss. These double slides are 28 meters tall and a steep 10-story drop. A ride on them is a 13.14 seconds drop. Best of all, this entire exhilarating ride is complimentary. RCL wanted Symphony of the Seas to bring a cool and revamped family atmosphere to the seas. They hit jackpot with the creation of the Ultimate Family Stateroom. The Ultimate Family Suite is a 1,346-square foot double-story suite furnished with imaginative and fascinating functional amenities. It features an in-room slide that runs from the kid’s bedroom to the living room, an air hockey table, and a tennis table. The suite is impeccably designed with the brightly-colored decor and has some of the best in-house entertainment options onboard including a private cinema and games like Nintendo, Xbox, and PlayStation. And as if that isn’t enough, the balcony features more play toys and amazing views. 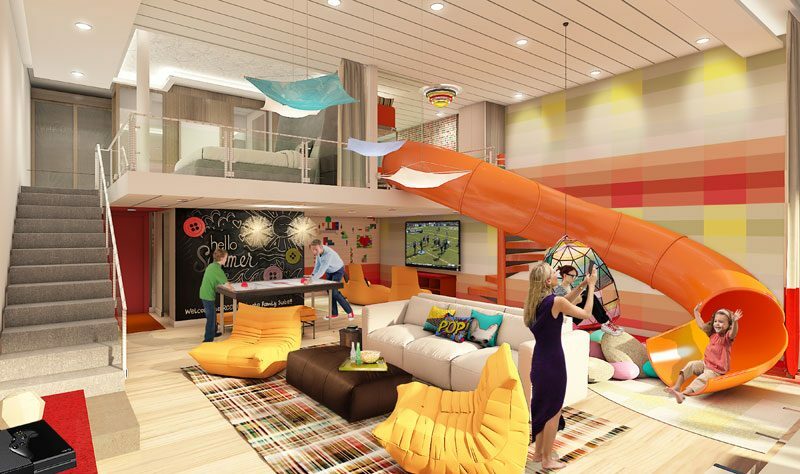 This suite will be the absolute highlight of your cruise for the kids. Book it early as it’s filling up fast. The entertainment on Symphony of the Seas has new firsts as well, like the ‘Flight: Dare to Dream’ production, the cruise line’s own new original production. It chronicles the memoirs of flight milestones starting in the future with space explorations and ending in the past with a tribute to the Wright brothers. Other performances include the 1977 ice skating performance that depicts the story of the time-traveling hero, Tempus. In this show, he is in England trying to save the queen mother’s Royal Crown Jewels. Also, back by popular demand is the Tony Award-winning Hair Spray production which is now bigger and better than before, with better choreography. Enjoy edge of the seat entertainment at the amphitheater with stunning acrobatic performances from professional divers, as they dive from great heights (30 feet) into the deepest swimming pool at sea found at the foot of the theatre. And enjoy even more entertainment from guest speakers, musicians, comedians, jugglers, dancers, magicians and ice skating performers. The dining experience on this ship is also impressive, with your favorite specialty venues making a comeback and some new ones added. Try Izumi’s sushi and sashimi rolls before heading out to its counterpart Hibachi grill serving up tasty grilled chicken, pork, beef, and shrimp. Enjoy a knives performance on the grill, before the food is prepared right before your eyes. Head out to Wonderland for a taste of pure imagination where chefs whip up unique, imaginative dishes based on mystery themes. Get served by the Mad Hatter himself and experience a truly unique way of ordering, where you brush the menu to reveal its contents. Enjoy surprises with each entree and finish off with amorphous cotton candy cocktails and melting chocolate surprises. If that sounds way too much for you, then try the new El Loco Fresh, a Mexican eatery serving Mexican delicacies and fresh seafood. Enjoy customizable tacos with unlimited filling options, along with quesadillas and nachos. For the best seafood, head over to the new Hook Seafood restaurant, A New England-style seafood place found at the end of the Solarium that serves fresh local seafood. Enjoy lobster, shrimp, crab claws and local fishes, including harvested oysters. Steak lovers also have a chance to delight in their favorite dish at Chops Grille. This joint offers the best hand-cut steaks in the house and now has an updated menu for Symphony of the Seas guests. For Italian tastes, head over to the famous British chef’s place, Jamie’s Italian restaurant. Enjoy your favorite Italian food fare at this venue. The food is handmade using seasonal ingredients, and the menu features cured meats, pickles, cheeses and delicious pastas such as pumpkin panzerotti and prawn linguine. Don’t forget to save room for the tempting desserts! Partake in nighttime adventures with a game of laser tag at the intergalactic battle for Planet Z and either conquer it or be conquered. The game takes place in a maze of rooms, made with neon-painted inflatable walls that glow in the dark. A unique feature found on RCL ships only is the FlowRider surf simulator, and Symphony of the Seas did not leave out this popular attraction. Test your balance and stamina on this 40-foot long surf wave simulator. Enjoy some good times with plenty of photos to either prove you are a pro or to laugh at in the future. Best of all, like most activities on this ship, a ride on the Flowrider is also complimentary. Find a range of Water shoes from Amazon right here. 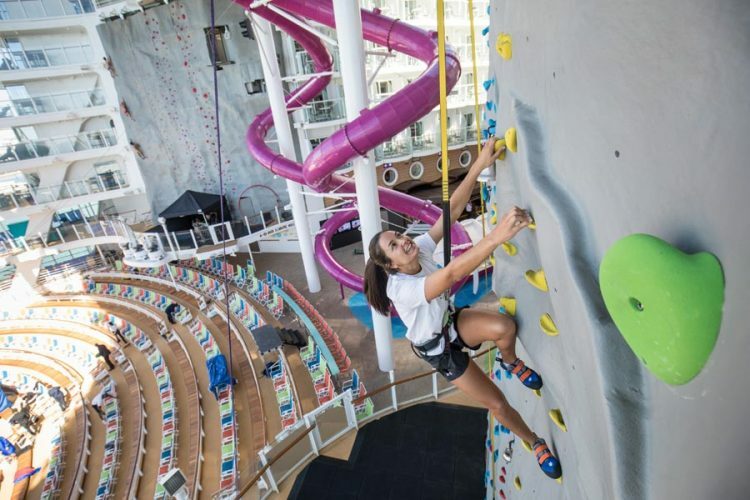 The popular rock climbing is also back and to think that Royal Caribbean once thought it wasn’t such a good idea. These rock climbing features have now become a staple on all ships in the fleet. Don’t miss a chance to try out the climb on this ship. You will know you have conquered the task when you get to the top and ring the victory bell. Symphony of the Seas boasts 23 pools, so no matter how many people this vessel carries, there will always be a less crowded pool for someone to take a dip in. Other than that, the ship also has one of the largest solariums at sea with a huge vista. Enjoy relaxing and being pampered at the spa, and afterword take a dip in the solarium pool. Beach items for your cruise vacation are over here. Try ziplining suspended above the Boardwalk. Enjoy the complimentary zip line course that runs across the Boardwalk and is at least nine stories above. Enjoy panoramic views of the surroundings and feel the rush of sea breeze on your face as you zip across the largest floating vessel on the sea. Another title that Symphony of the Seas has garnered is the most instagrammable ship in the world. To that effect, the cruise line has even hired Instagram expert Russ Francis to become its first-ever Instagrammer-in-Chief officer. Not only will you be snapping extremely cool and bragalicious photos on the largest cruise ship in the world, but an expert Instagramer will give you tips on how to take the most insta-worthy shots, on the most instagrammable spots on the ship. A new addition to the food scene on this ship is Sugar Beach, an ice cream and sweet treats joint. This new eatery boasts every flavor of ice cream with as many sugary treats known to man as possible. Visit this place and please your sweet tooth to your fill. Symphony of the Seas also has something for all you sport lovers, a new sports bar that ensures you never miss your favorite match while at sea. This bar features plenty of TV screens showing live games. So, whether you love football, soccer, tennis, golf or basketball, you are sure to catch your favorite sport here. On top of that, the venue also serves one of the best burgers at sea, with hot chicken wings and great fries to accompany every bite. See You on Symphony of the Seas! Clearly, the largest cruise ship in the world is not only big, but also has some of the most impressive cruise ship features out there. 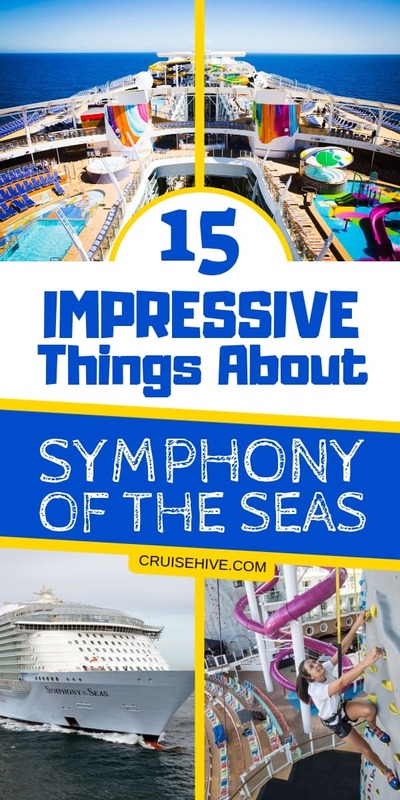 If you are looking to cruise on this amazing vessel, then get booking right now so you can start experiencing these impressive things when you say “Bon Voyage” with Symphony of the Seas.